The Stafford Brothers Season 1 and Season 2 (16x30mins) now available for worldwide acquisition. What happens on tour, no longer stays on tour. The Flying Winemaker – In Development. WDE has partnered with Eddie – The Flying Winemaker – a Hong Kong based, Australian master wine-maker who specializes in pairing Asian wines with Asian cuisines. (Lifestyle). 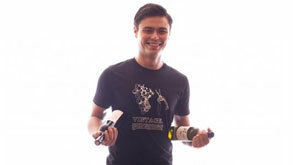 WDE has partnered with Eddie McDougall, The Flying Winemaker, a Hong Kong based Australian master wine-maker who specializes in pairing Asian wines with Asian cuisines. (Lifestyle). The series is represented by ABC Commercial for worldwide sales with an upcoming launch in Cannes as part of MIPTV 2013. WDE's The Stafford Brothers Season 2, now playing in more than 20-territories worldwide. Series 2 opens on the beaches of Thailand following the Stafford Brothers sold out tour, along with their manager Joey's stint in health-rehab and Brooke's relocation from the Gold Coast to Sydney.